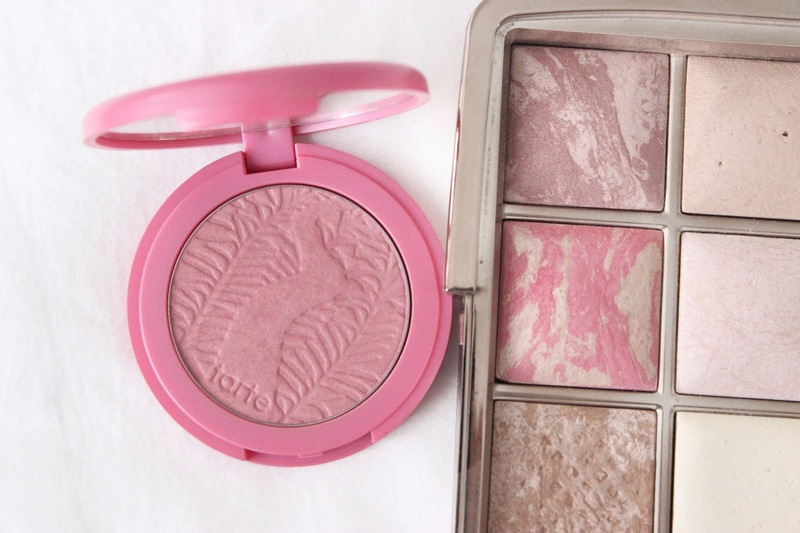 It's not secret that Tarte blushes are one of my favourites in terms of formula. I have 5 or 6 of them in my collection but this one is the most recent one I purchased. They have the right amount of pigmentation, they're not patchy, they don't have any powder kick up no matter what brush I use, and they last on your cheeks although definitely not for 12 hours. No matter how much I use them they don't seem to have a dent in them as well. This one is a perfect mid tone pink on me, with a hint of mauve. It looks like a flush instead of a light or bright pink. Hourglass Ambient Lighting powders instantly became holy grail status for me. Advanced makeup technology right here! This blush gives the most beautiful luminous finish, and I would describe the colour as a fresh pink. It lifts up your makeup look and it lasts aaalll day long. I would say it's more pigmented than the Tarte one and you don't need a lot, although you can defnitely build up if you want to. There's just something magical about this formula and I would repurchase this in a heartbeat. What's your favourite blush? I'd love to know!